Can four young lawbreakers outsmart London’s most powerful gangster? Scope is not your average teenager. A self-described criminal nerd, she spends most of her time cleaning up forensic messes and faking evidence. When you work for Move-Easy, London’s most powerful thug, life is never boring. But WatchWorld owns the city now, and running an illegal empire is no easy feat. Cameras, drones, and heat sensors line the streets and stalk the skies while Safe-Guards, the part-human, part-robot police, patrol the city and enter homes with impunity. Everyone knows that crossing Move-Easy means certain and painful death. So when he sends Scope and several other rat runners—young outlaws who evade detection by traveling through the city’s Voids—to track down one of Easy’s old enemies, they know they have no choice. But what if the target is innocent? Can Scope spoil the kill, or will doing so make her Easy’s next mark? This is a Rat Runners novella. 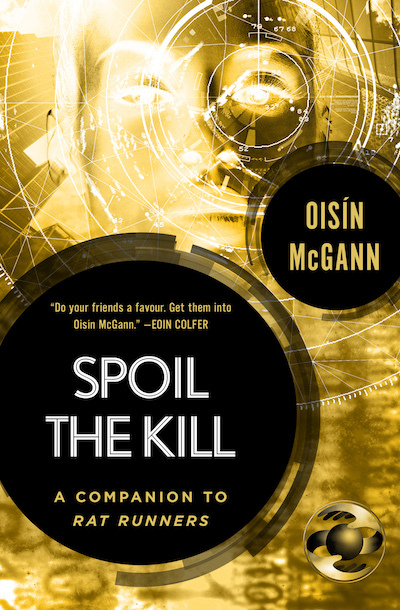 For the full experience, be sure to read Rat Runners by Oisín McGann, available January 13, 2015.